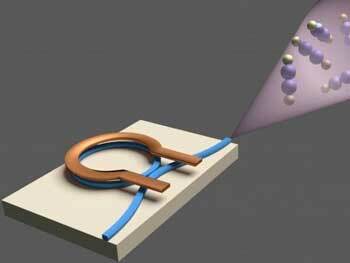 (Nanowerk News) Researchers at Columbia Engineering have demonstrated, for the first time, a chip-based dual-comb spectrometer in the mid-infrared range, that requires no moving parts and can acquire spectra in less than 2 microseconds. The system, which consists of two mutually coherent, low-noise, microresonator-based frequency combs spanning 2600 nm to 4100 nm, could lead to the development of a spectroscopy lab-on-a-chip for real-time sensing on the nanosecond time scale. “Our results show the broadest optical bandwidth demonstrated for dual-comb spectroscopy on an integrated platform,” said Alexander Gaeta, David M. Rickey Professor of Applied Physics and of Materials Science and senior author of the study, published in Nature Communications ("Silicon-chip-based mid-infrared dual-comb spectroscopy").